I'm an editor and supporter of Wikipedia - contribute here. Hi there Web Surfers. I'm an old retired guy from the United States Air Force and IBM. I live on the island of Nantucket off the coast of Mass. and in Englewood, Florida with my wife, Cynthia of 37 years. I have three children in Haiku China, Virginia, and Minnesota, eight grandchildren, and eight great-grandchildren. I'll tell you about my hobbies and principal interests in the spaces below. 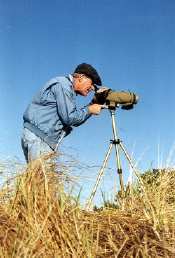 -- I've been 'Birding' since I was 12 years old -- that's over 65 years. My mentor was a wonderful lady named Edith Andrews , who is no longer with us. We are so lucky she shared her 100 years with Nantucket's birds. I have seen 691 species of birds in North America and 1,176 worldwide. I can identify most birds by their calls alone. I really enjoy sharing my enthusiasm for bird study with others and find the best way to do that is by writing about them. In 1976, while stationed on the island of Formosa with the U.S. Air Force, I co-authored (with the late Sheldon Severinghaus) A New Guide to the Birds ofTaiwan . About the same year I started a series of bird guides for the island of Nantucket with birding legend, the late Edith Folger Andrews. That book, called Birding Nantucket , has been updated eight times with its most recent release in 2014. The bar charts are a wonderful feature of this book. Click here to see them on-line. Here is a current list of all species that are considered 'Accidental' on Nantucket.. This has mushroomed into a series of eight books about Nantucket's birds -- Birding Nantucket the Series. You can see a table of the 229 species described, and where to find them - here AYBN Bird Index. 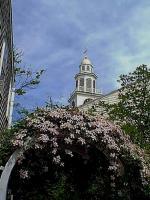 From 2003 until 2010 I wrote a weekly column, The Birds of Nantucket, for the Nantucket Independent newspaper. Alas, that weekly newspaper has gone out of business. You can get a quick link to many of my books by going to my Amazon Author's Page . 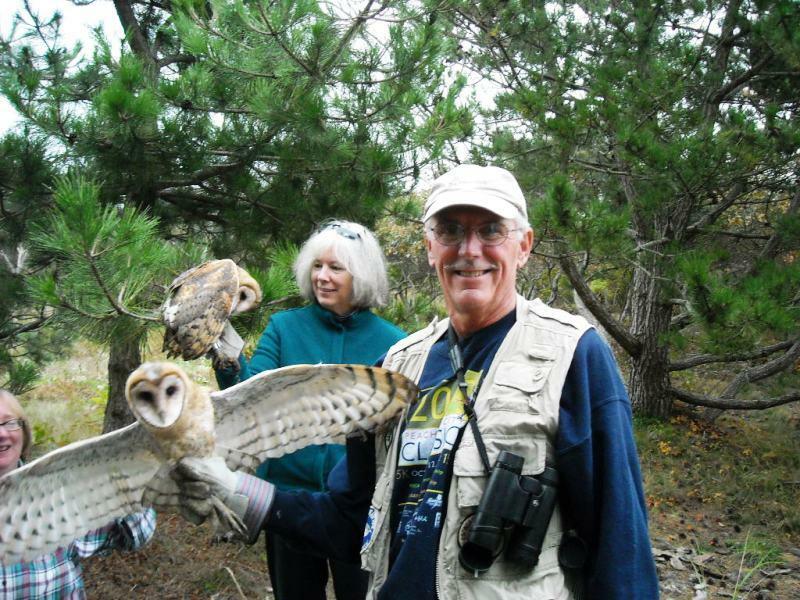 Above left, you can see me on a Maria Mitchell Association Barn Owl Banding mission in 2008. You can click that picture to go to a page that has a lot of birding web links. The picture on the right shows me scoping some ducks on Nantucket's upper harbor from Pocomo. The Ham Radio hobby has brought me many benefits. My electronic skills got me a good job in the Air Force, plus I've made many wonderful friends all around the world. I hold an Extra Class FCC license with the call sign of W1NQT. Here's a link to an article I wrote about ham radio. To the right you see me sending Morse Code during a Field Day operation with the Englewood Amateur Radio Society (EARS) . You can click that picture for interesting Ham Links on the web. The sport of Badminton has been a major avocation for over 50 years. In 1973 I was the Colorado State Singles Champion. For many years I was a National Umpire with USA Badminton, Headquartered in Colorado Springs, CO. Now I play mostly with other seniors. The picture to the left shows me at the Boston Open Tournament in March of '99 with one of my favorite players, Andy Chong. You can click anywhere on that picture to find interesting Web Sites that relate to the sport of Badminton. I was born on Nantucket back in 1941 and lived there 'til I graduated from High School in '59. I then joined the United States Air Force and had jobs as an aircraft radio repairman, computer programmer, and then in personnel data systems. I was stationed at Westover AFB, Syracuse University, Randolph AFB, the USAF Academy, Taipei Air Station, and did short duty in Greenland and Labrador, honorably discharged as a Captain in 1975. After finishing an MBA in Finance and Marketing at Syracuse University in 1977 I had a career with IBM, in Systems Engineering and Manufacturing Consulting, finishing as a Senior Planner in Atlanta in 1996. In retirement mode, we live on the island part of the year, and in Florida the other part. On the right you see a scene from Nantucket. If you click on that picture, it will take you to some other web links about the quaint, windy island. In 1992 we visi ted my sister-in-law down in Englewood, FL and bought a house there, thinking of retirement. Englewood is 100 miles south of Tampa. Click anywhere in the picture for more Englewood links. Starting in 2016, we are escaping Nantucket's cold and wind by being in our Florida home. Perhaps we'll transition there completely in a few years. I love to read, but I hate to find myself reading the same book twice. So, for over 20 years I've been maintaining a spreadsheet of all the books I've read, Link to Ken's Reading List. The list is 'more-or-less' in date sequence, oldest at the top. You can search within this page and then use the 'back' button to return to this page. I strongly believe my country was very wrong to attack Iraq. I tried everything I could do to influence public opinion and my elected representatives to have the U.S. follow the U.N. Process rather than act like a 'rogue' nation. I was not a Democrat before the war. The war made me a Democrat. Now, it seems like the Democrats are drinking the war cool-ade as well, and I have registered as Independent. As the neo-conservatives marched us inexorably toward war, I wrote several letters to the Inquirer and Mirror newspaper here on Nantucket. Please click the following to view these letters. Jan. 26 Letter, Feb. 2 Letter, Feb. 10 Letter, Feb. 24 Letter., and/or, April 7 Letter. Here are additional letters I have sent to all my elected representatives and the Inquirer and Mirror and the Nantucket Independent. I am also extremely concerned about the effects of Depleted Uranium (DU) being used in our shell casings. A much smaller amount used in the 1991 war has resulted in a 30% disability claim rate amongst our Gulf War Veterans. Gulf War Syndrome is the polite name for this' problem. Find out more about his by going to Traprock Peace Center. You can click Here to go to my Peace Site web page which has many good links on it. Back in the early '90s, the Clinton era was just beginning and those of us who love cats were happy to see a new feline inhabitant of the White House. I researched and wrote a children's book called "Socks Goes to the White House" and was well on my way to getting it published when the administration put out guidelines that Socks was 'off-limits'. Seems that some reporters found Socks outside one day, picked him up, patted him, photographed him, and Chelsea was really upset that her pet might have been hurt. Also, the White House quickly became embroiled in travel agent scandals and other personnel issues that made it difficult to get them to endorse or agree to anything. Anyway, I've converted my little book to a web page which you can view by clicking here. It's aim is to be a children's tour of the White House through the eyes of the "first cat". Even though I was unable to get it published on paper, I hope many people can still enjoy it. -- Click Here! -- . Send Ken Blackshaw a Note! Check out our current photo selections on My Flickr Photo Albums. Click on the references below for some good web sites that tell about other things near and dear to me.